Today’s spotlight is on “Bella”. This beauty was rescued from the Richmond Texas City Animal Shelter. Her family needed a working dog to be in charge of family home security. 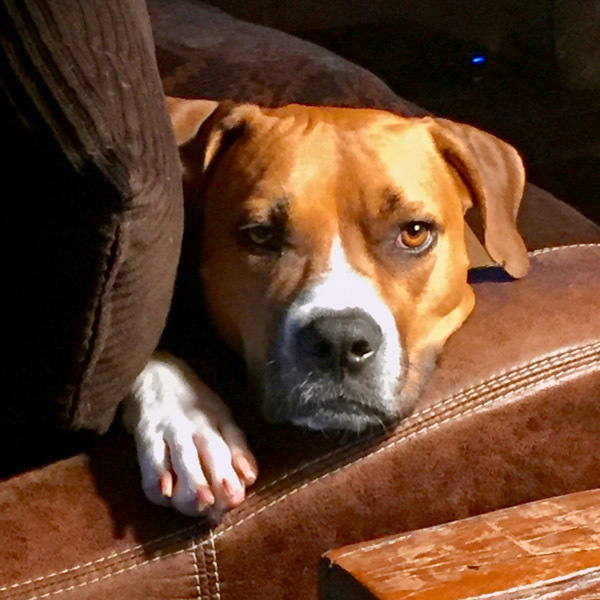 Bella’s impressive looking mixed breed “boxer” heritage and the fact she weighs in at 70 pounds made her the top choice. However, with Bella’s winning personality and loving nature, she instantly claimed the hearts of her new family of two adults and two girls and was elevated to “pet” status. As for home security, turns out Bella was a natural, no instruction required! We are happy to say that Bella lives mostly indoors in luxury country estate surroundings with a loving family and she still is a top-notch security guard. Besides, there is the 2-acre fenceless yard with the creek along the back property line that needs to be monitored each day which Bella does from the large shaded patio. It’s hard work but somebody has to do it, right? It is reported that when not on guard duty, Bella believes she is seven years old Sophia’s twin sister on 4-legs and expects to spend most of her off-duty time as Sophia’s couch pillow.